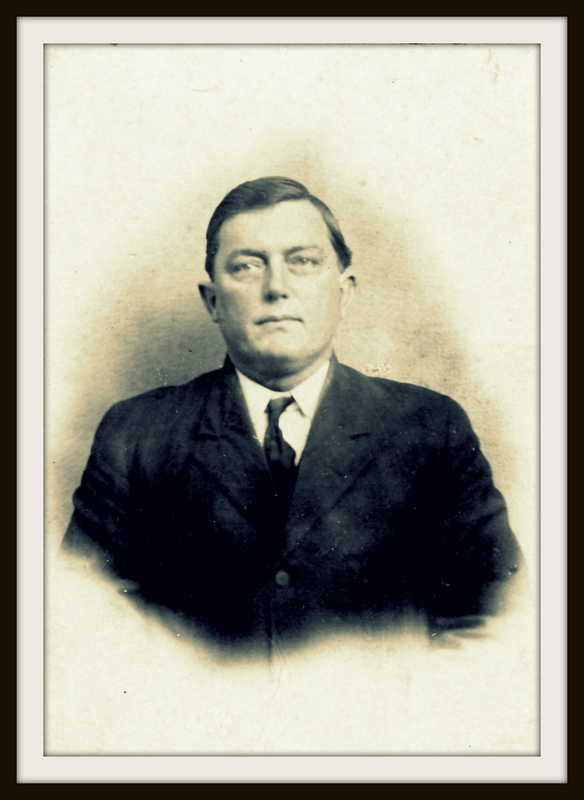 Perry Thomas Knight was born March 7, 1877 at Rays Mill (now Ray City) Berrien County, GA. 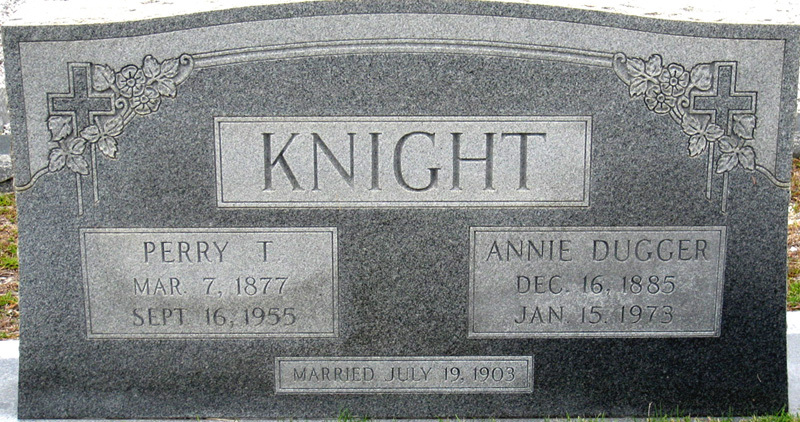 He was a son of George Washington Knight (born 1845 in GA; private, Company E, 54th Georgia Regiment, C. S. A., serving four years; died 1913) and Rhoda (Futch) Knight (born 1846 in Berrien County, GA; died 1909). P.T. Knight attended the Green Bay School near Ray City, completing there in 1896. In 1897, he returned to the Green Bay School as a teacher. He made an excursion to Terra Ceia, FL in 1898 , then returned to Berrien County and taught at the Cross Creek School in east Berrien county. 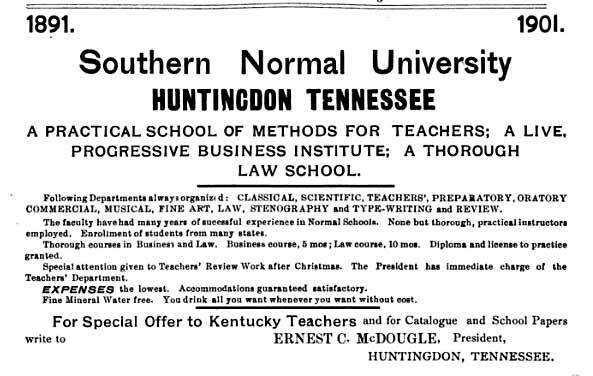 Knight then attended Southern Normal University in Huntingdon, TN. He graduated in 1901 and returned to Berrien County to begin the practice of law. His practice frequently included handling the legal affairs of residents and businesses of Ray’s Mill (later Ray City, GA). Perry Thomas Knight married Annie Lotta Dugger on July 19, 1903. She was a daughter of Wiley Jackson Dugger and Sallie (Bowen) Dugger. Her father was a hotel keeper and Justice of the Peace at Boston, GA. Application was filed with secretary of State Philip Cook yesterday for a charter for the Bank of Milltown, at Milltown, in Berrien county. The capital stock of the new bank is to be $25,000 and the incorporators are J.V. Talley, W.L. Patton, P.T. Knight and L.J. Clements, Jr.
P.T. 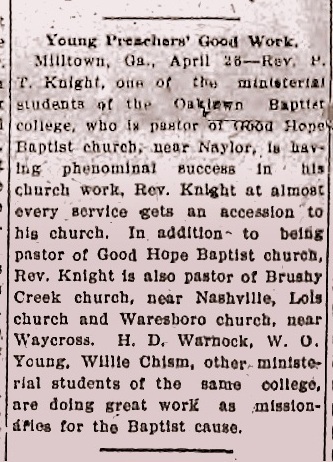 Knight attended ministerial school in 1909 at Oaklawn Baptist Academy in Milltown, GA (now Lakeland) and served as pastor of Good Hope Baptist church at Naylor, Brushy Creek church near Nashville, Lois church, and Waresboro church near Waycross. He was a Mason and served as lodge master of the Lakeland Lodge 434 F&AM. He had a farm on RFD #2 out of Milltown (now Lakeland), GA. He employed Robert Lee Mathis and Charles Anthony Ray to farm it. 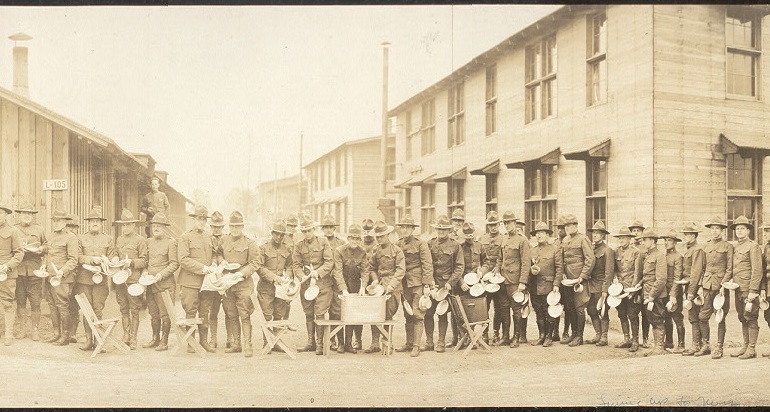 During World War I, P.T. Knight registered for the draft , his draft card being completed by D.A. Sapp on September 12, 1918 at Nashville, GA. He gave his address as R.F.D. Milltown, GA. His occupation was Minister. He was of medium height, stout, with blue eyes and dark hair. He was commissioned 1st Lieutenant and Chaplain in the 5th Infantry, 17th Division at Camp Zachary Taylor, KY .
On Nov. 25, 1918 Knight was attached to 5th Infantry at Camp Beauregard, La. He received an honorable discharge on December 4, 1918. 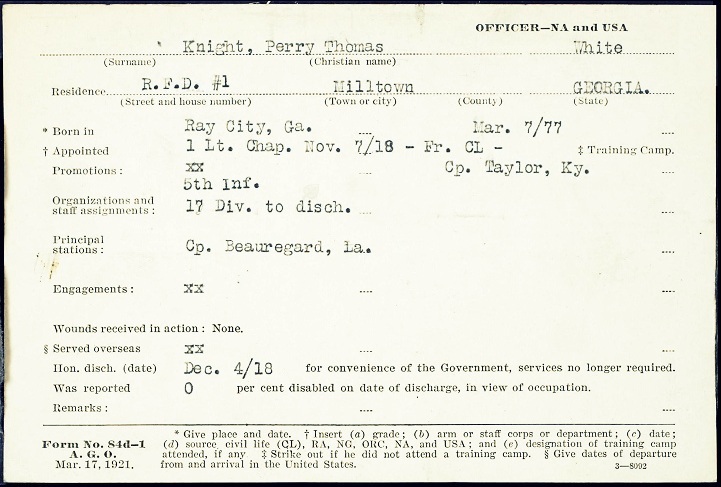 Perry Thomas Knight, WWI Service Record. Perry T. Knight was listed among the ordained ministers of the United States in the 1919 American Baptists Yearbook. In 1920 he joined the Baptist Chaplains Club, an organization of military chaplains dedicated to supporting the work of chaplains in the service and to securing legislation relative to the chaplains’ work. By 1925, he had served 4 years as pastor of the Baptist Church of Ray City. In 1921 things were not going well for farmers in Ray City, GA or elsewhere around the state of Georgia. Perry T. Knight wrote an open letter to the members of the Georgia General Assembly proposing a special legislative session to consider the plight of the farmers and to enact legislation to protect them from looming financial disaster. In 1923, Knight prepared a record of the outstanding accounts of the Ray City Supply Company in part to reconcile the estate of Francis Marion Shaw, who had an interest in the business. He also led the fundraising effort to pay for the Doughboy Monument in Nashville, GA. In the 1920s Perry Thomas Knight became active in state politics. He was elected to the Georgia Assembly and worked in various elected and appointed positions. His career in public administration is described in the Georgia Official and Statistical Register. Senator Perry T. Knight, of Ray City, was appointed to serve on the Western & Atlantic Railroad Commission in 1925. The General Assembly of Georgia, by an act of 1925, directed the Georgia Public Service Commission to compile all data pertaining to the Western and Atlantic railroad and instructed it to employ its consulting engineer, J. Houston Johnston, to prepare the report. The Western & Atlantic is the historic railroad line from Atlanta to Chattanooga, TN and is still owned by the State of Georgia. The Western & Atlantic Railroad was the locale of the Great Locomotive Chase of the W&A locomotive, The General, during the Civil War. While engaged in public service, Perry and Annie moved to Atlanta, GA where they lived until his death. Perry Thomas Knight died September 16, 1955. He was buried at Union Church, Lanier County, Ga.(aka Burnt Church). Annie Lota Dugger Knight died January 15, 1973. Buried at Union Church, Lanier County, Ga.
Perry Thomas Knight, subject of previous posts, studied the ministry at Oaklawn Baptist Academy in Milltown (now Lakeland), GA. Perry T. Knight was the son of George Washington Knight and Rhoda (Futch) Knight, and the grandson of Aaron and Nancy (Sloan) Knight, and of John M. and Phoebe (Mathis) Futch. Knight grew up in Ray City and became prominent in local and state government. 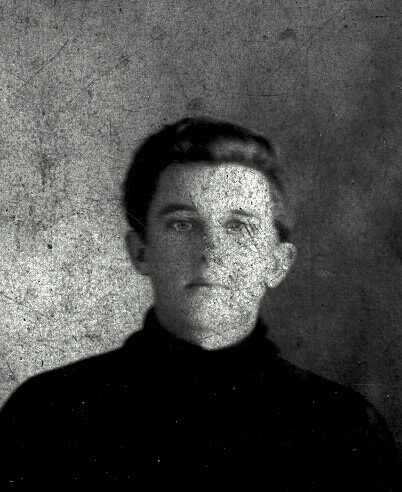 While a ministerial student at Oaklawn Baptist Academy in 1909, Perry Thomas Knight was already a popular preacher. Milltown, Ga., April 28 – Rev. P. T. Knight, one of the ministerial students of the Oaklawn Baptist college, who is pastor of Good Hope Baptist church, near Naylor, is having phenominal success in his church work, Rev. Knight at almost every service gets an accession to his church. In addition to being pastor of Good Hope Baptist church, Rev. Knight is also pastor of Brushy Creek church, near Nashville, Lois church and Waresboro church, near Waycross. H. D. Warnock, W. O. Young, Willie Chism, other ministerial students of the same college are doing great work as missionaries for the Baptist cause. Work began on the school in 1905 and the construction progressed rapidly. Work has been progressing bravely upon the Milltown college, a large force of hands being already at work. The construction is being pushed as rapidly as possible on account of the desire to be ready to open the school as soon as possible. The original plans called for the construction of three large buildings, though it is thought now that five buildings will be erected. The building grounds are said to be the handsomest in the state and the college campus will be one of the prettiest in the south when it is completed. It contains fifteen acres and a pretty creek runs through the groves making it easy to convert them into a beautiful park. By fall of 1906 construction had progressed to the point where classes could begin. 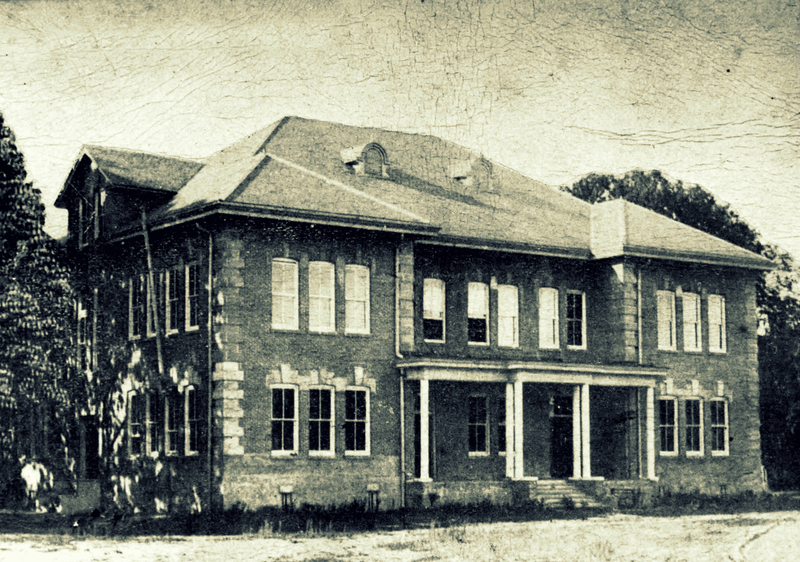 The school opened September 17, 1906. A partial list of the administrators and faculty who served at the school has been gleaned from newspaper accounts. Construction on the school continued for years, sometimes in the face of financial challenges. 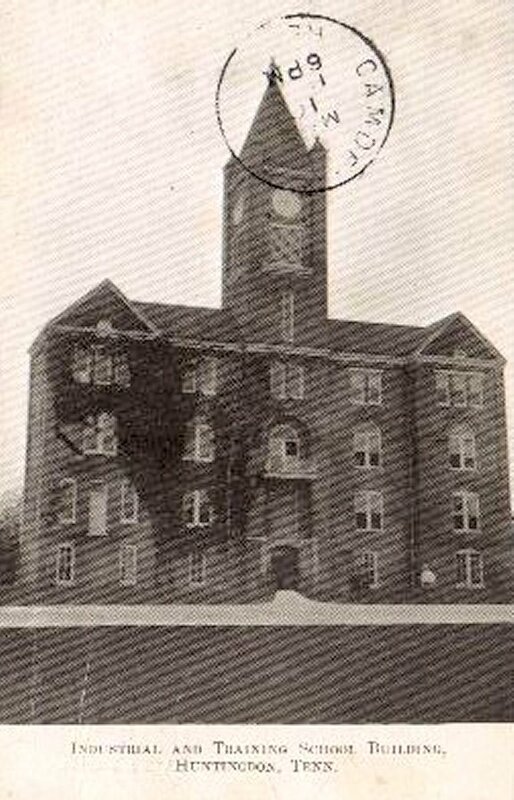 By spring of 1909 the main building was nearing completion. Milltown, Ga., April 23. – (Special.) – The local Masonic Lodge is figuring on having a big time on the completion of the main building of the Oaklawn Baptist college situated at this place. The Masons will lay the cornerstone with the usual Masonic ceremonies. They expect to have Grand Master Jeffries and Grand Senior Warden Henry Banks and, possibly some other men who stand high in Masonry. The Oaklawn school will also have, on the opening day, several prominent speakers, and together with the Masons, they expect to have a big time. The date for this big occasion will be announced later, as the carpenters and painters are putting the finishing touches on the building now.